In highschool, I choregraphed a dance to “Standing Outside the Fire” by Garth Brooks with a friend. Those who know my dancing skills are laughing hard right now, especially since I put myself and “choregraphed” into a sentence together. But, I only tell you this to show off that I’ve got quite the background in country. Girl can get down to some Garth. Today is the final reveal to show that I’ve gone country, dog gonnit. 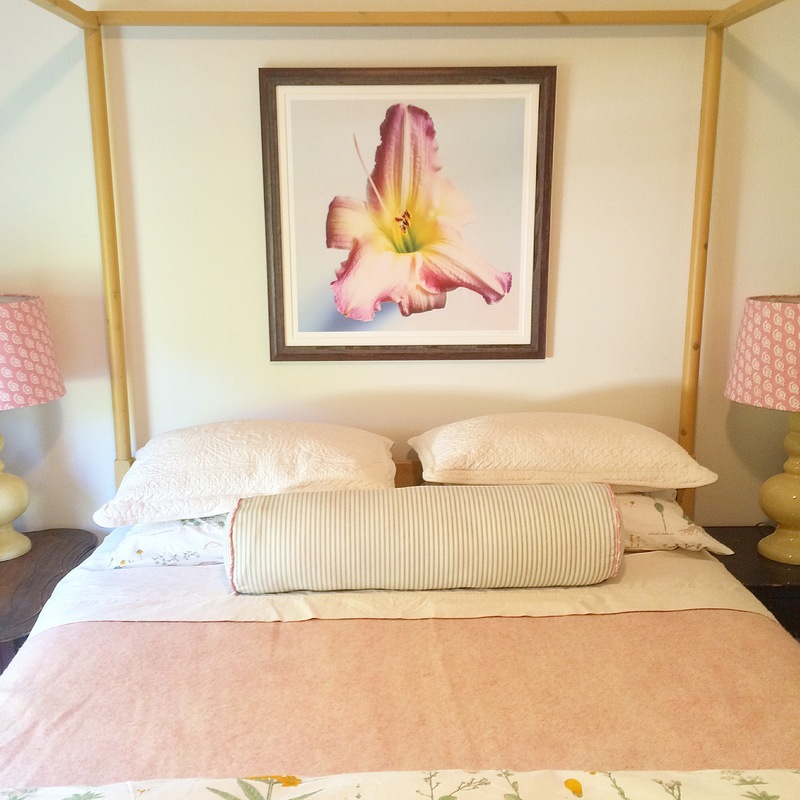 To keep you up to speed, a lovely client, asked that I decorate a guest bedroom at her second home in the country. She willingly went along with Linda of Calling It Home’s six week challenge to let me put the entire room together start to finish in just six weeks. The bedroom sits on the ground floor of their country house and it overlooks the garden so I have dubbed it “the garden room.” I know, so very creative. But, if you say it in a snobby voice, it sounds very sophisticated. 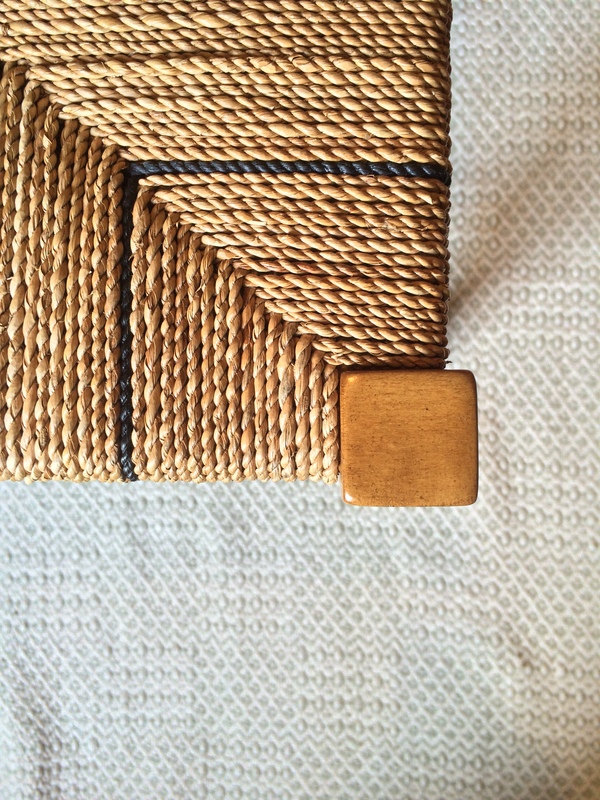 We went with a mixture of high and low/antique and new to pull the look together. 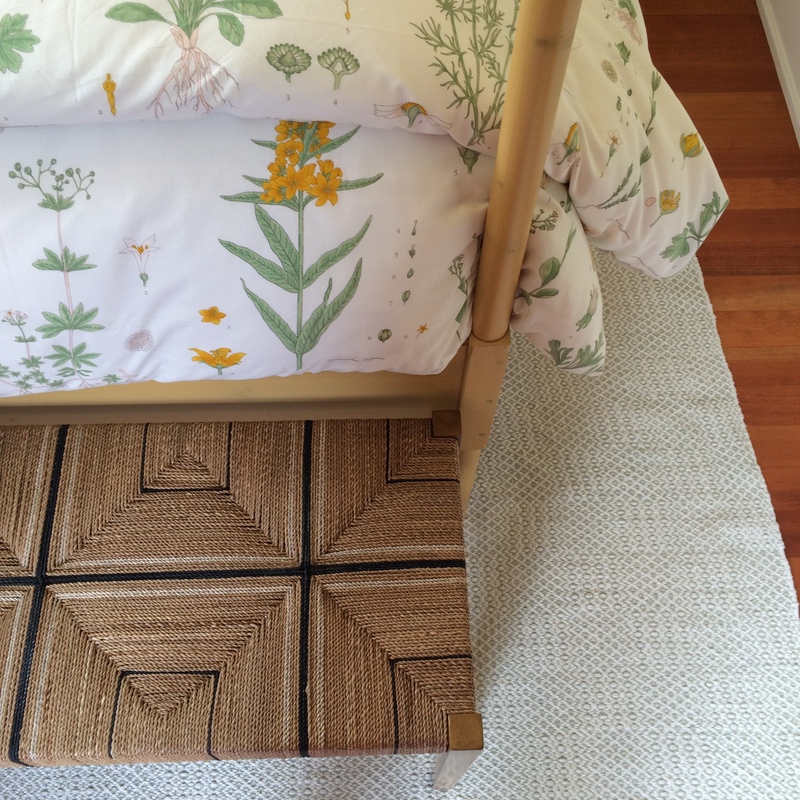 The bedspread was the starting point for the entire design and it came from Ikea of all places. 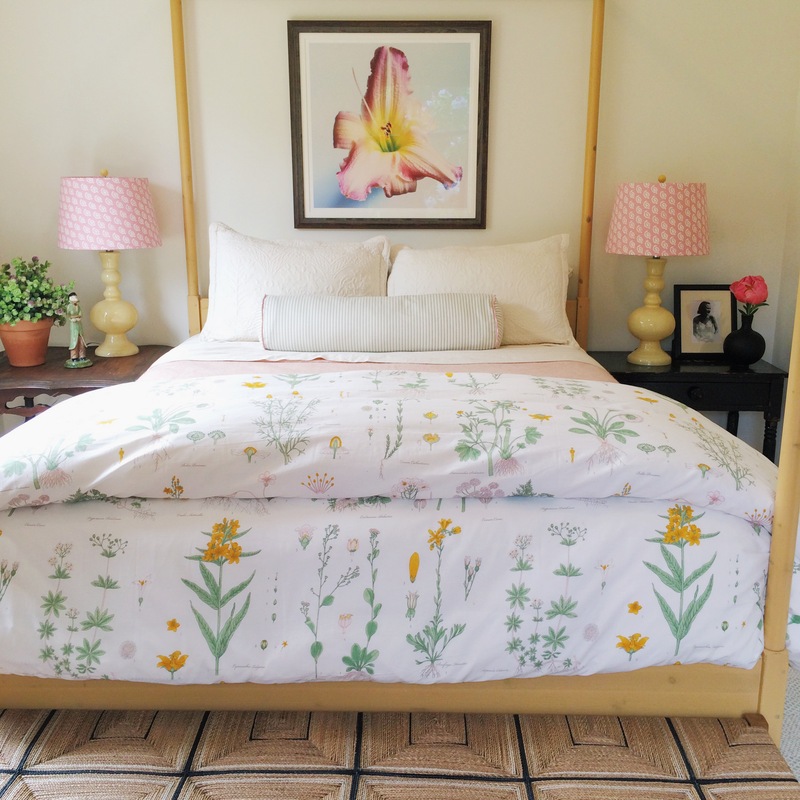 The bed frame is also Ikea but no longer in production – it was a major Craigslist score. Bench at the end of the bed is Serena and Lily. The rug is Bunnie Williams for Dash and Albert. 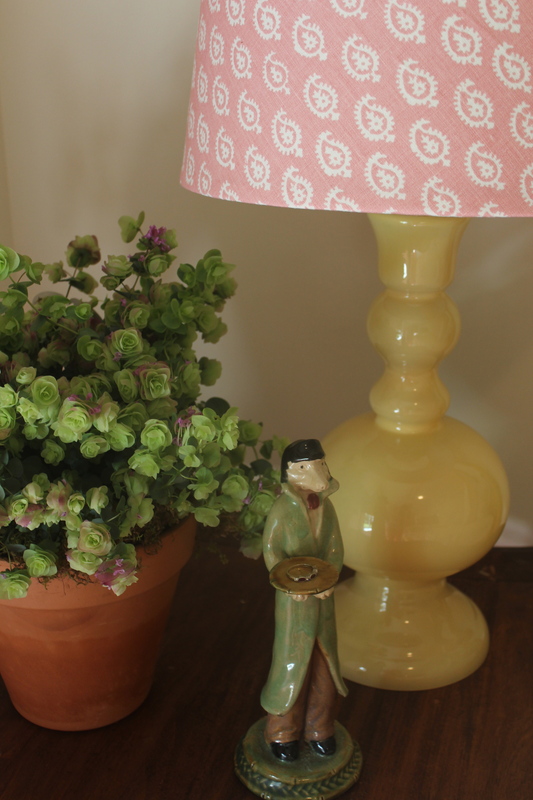 The lamps I got at a local shop and the shades I recovered in Peter Dunham fabric. The big roller I had custom made with green ticking stripe and a piping in the matching Peter Dunham fabric. 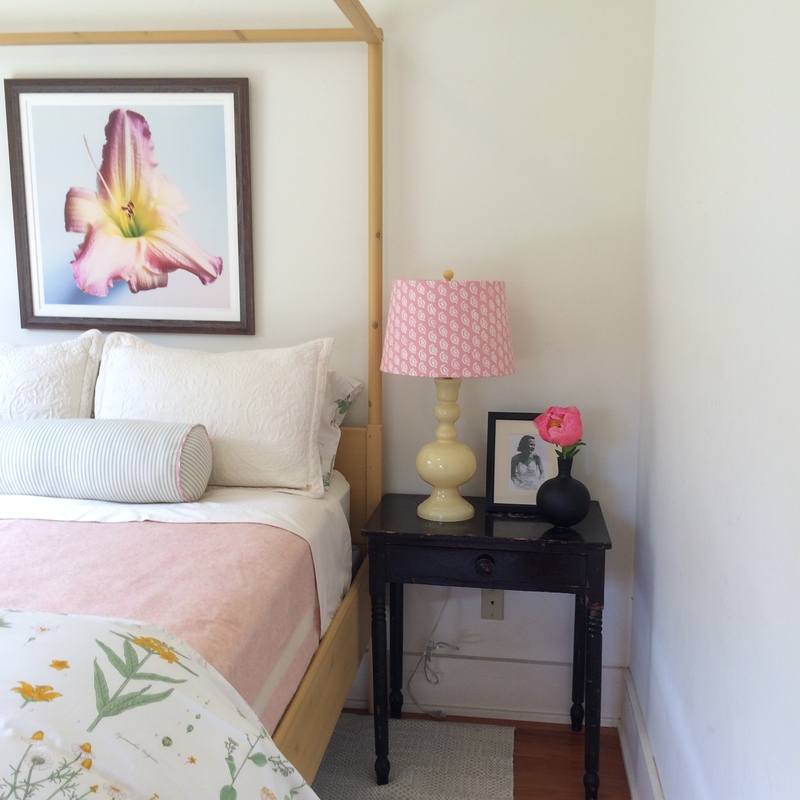 My favorite part is the beautiful photograph by Julia Lynn above the bed. The black side table on the right hand side, while absolutely beautiful belongs somewhere else in the home and sits there for the photoshoot while I await the Chairish side table to come. 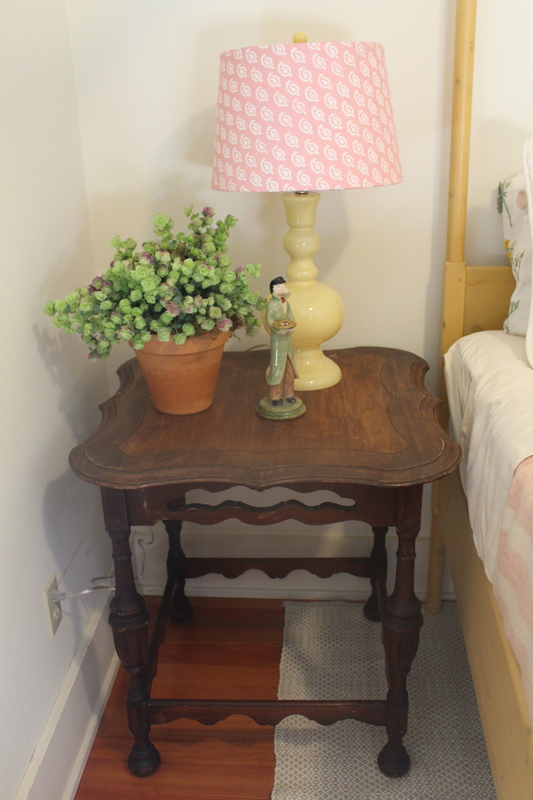 It was the first thing ordered – a gorgeous dark wood antique spindle table and I can’t wait for it to eventually arrive. The dresser on the side of the room was already there and it’s gorgeous. 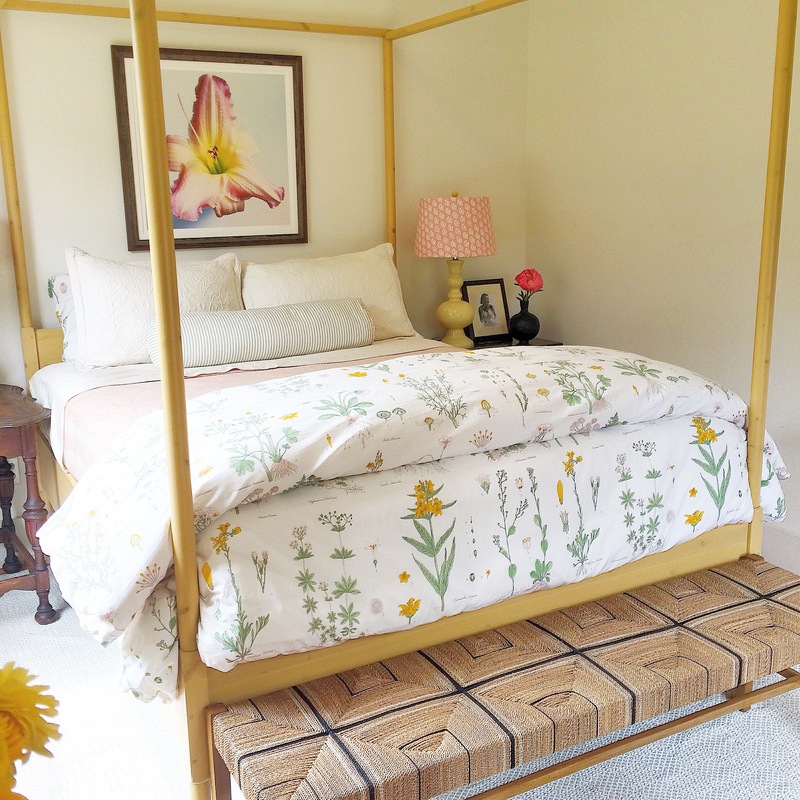 The antique faux bamboo chair is also my clients (I wish I could take credit for finding it) and doesn’t reside there as there wouldn’t be any need for a bench and chair at the foot of the bed but I thought it looked pretty for the pics. There also was a debate between white and blue pillows for the bed. In the end, we went white for the softness it brings but I included one pic of the blue for you to see. 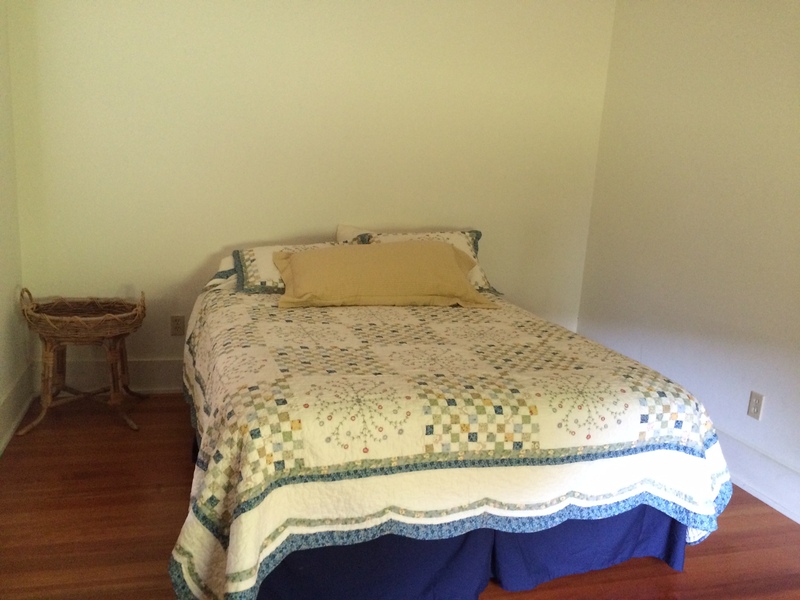 Check out the other participants beautiful finished rooms here. Beautiful! I totally agree with you! Tackling a room in 6 weeks is exhausting, but I’m happy it’s done. Kate, this is adorable! And I love how the bench bohos it up a bit. Great job! What a perfect space! Your client must be thrilled. 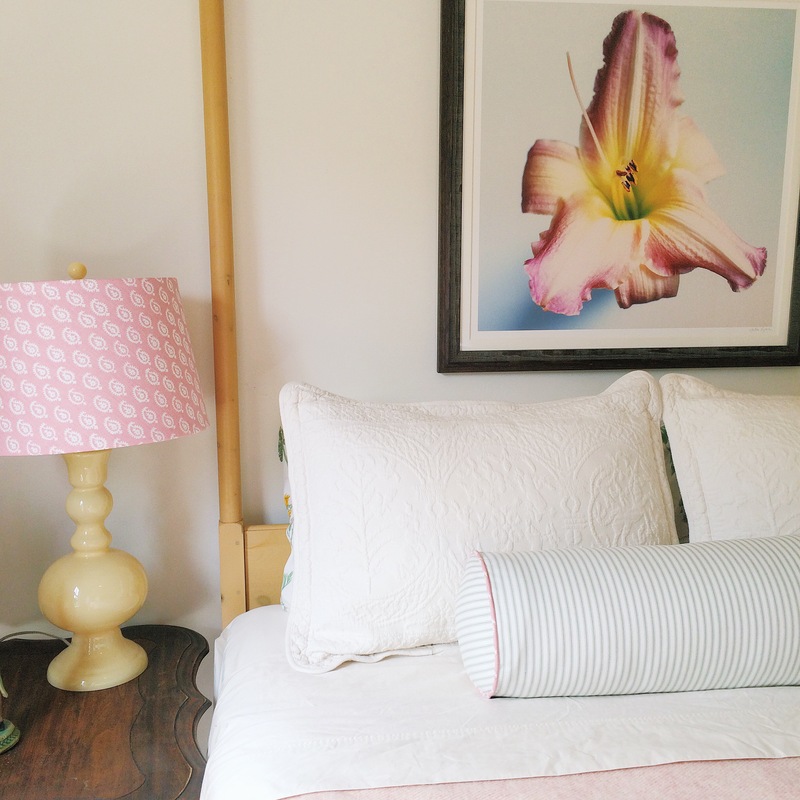 Love those lamp shades and the stool, the bedding…..all of it. Great job! It’s perfect! Seriously! I love this room and I have to say the artwork completely ‘finishes’ the room. Wow! Love, love this! Beautiful job! I just LOVE that room. I can’t believe that you pulled it all together in just six weeks!. I would keep the chair in the room because once a guest is staying there the bench will get used for clothes and bags (there doesn’t appear to be a closet) and the chair will give the guest a place to sit. What a glorious transformation! Makes me want to fling open the windows to the garden and luxuriate on the bed all day with a good book. Bravo! It looks amazing! What a great transformation, definitely worth all the long hours. So fresh and chic!! Amazing transformation…well done!! love it, super cute and fresh! This is so beautiful and so chic. What a gorgeous room. 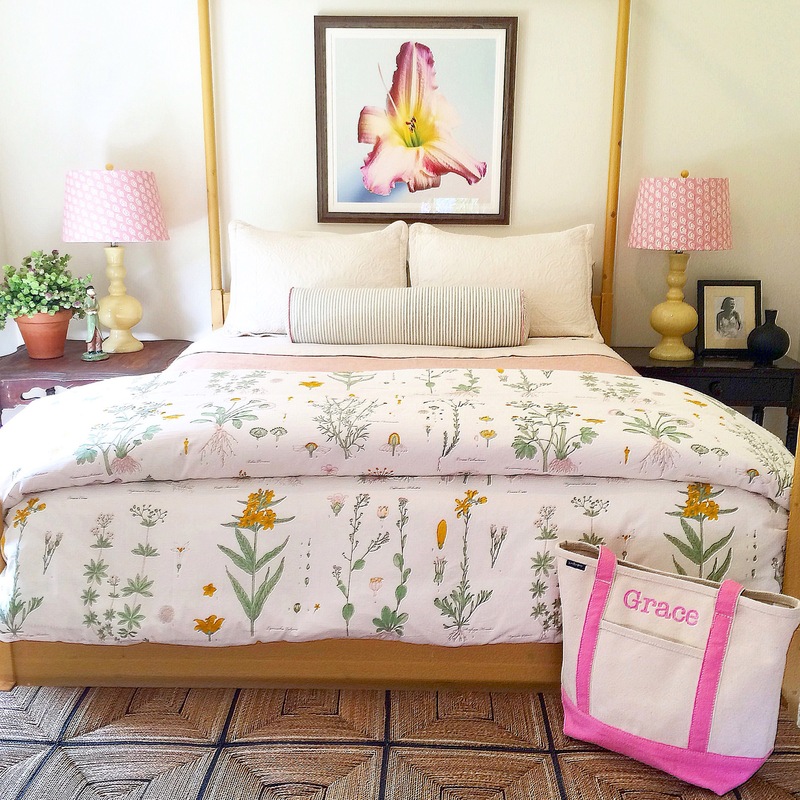 I love the colors, fabrics and that wonderful art above the bed. It looks fantastic, Kate. Lucky client. Beautiful Kate! Lucky client and guests. Absolutely love it! I can picture you dancing in those cowboy boots right now and it makes me so happy. The best! Love you. Bravo! I adore this room/transformation. Would like to see the window coverings, shade or drapes? So refreshing and inviting, may I spend the night there?!! The room looks great! 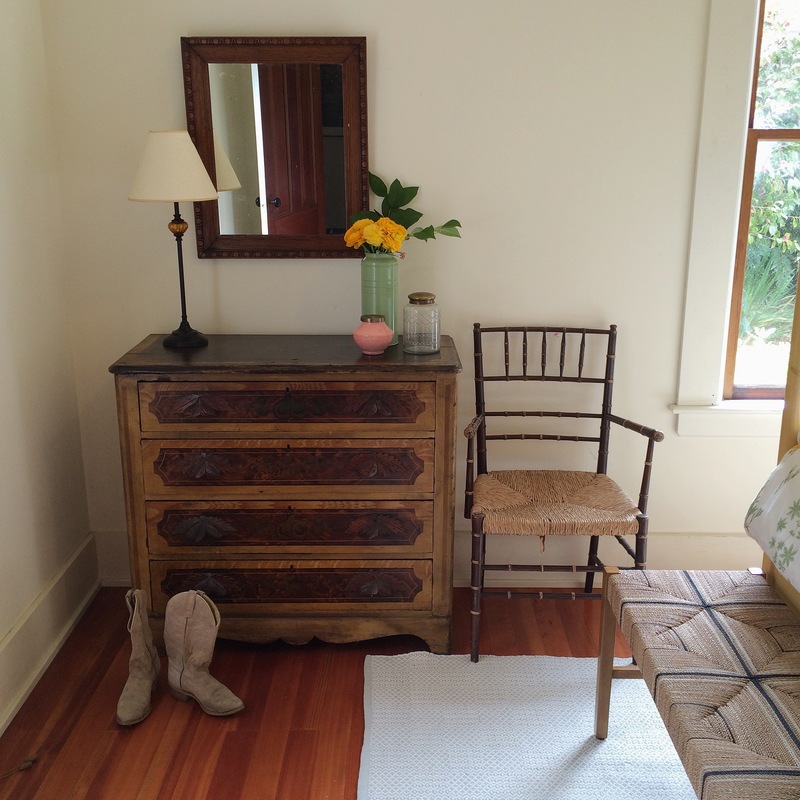 I love the bench at the foot of the bed and the antique dresser. Everything is just so pretty! Great job! 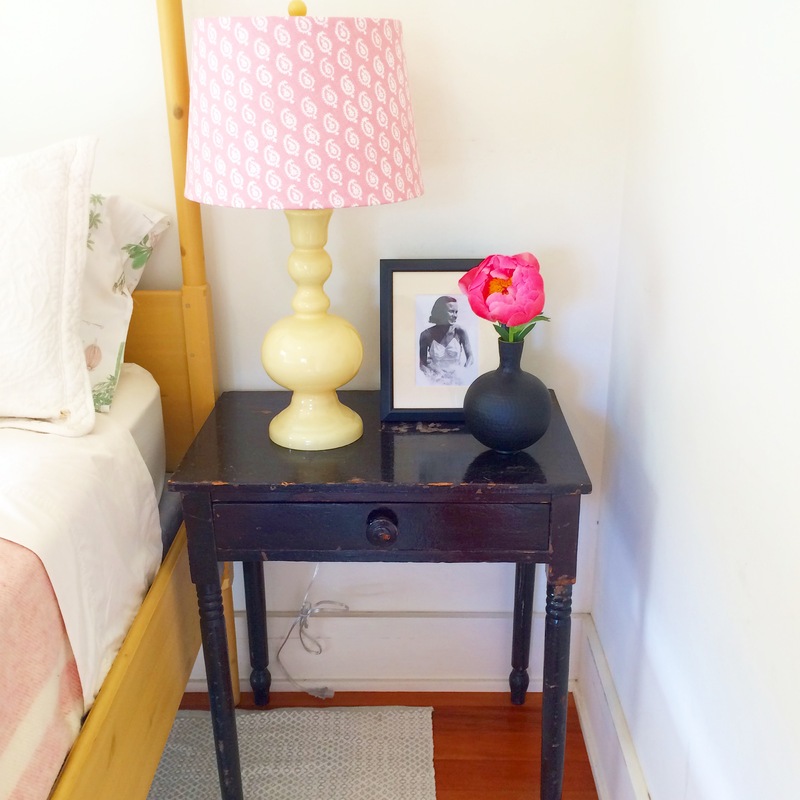 I love that navy nightstand! Just lovely!!! 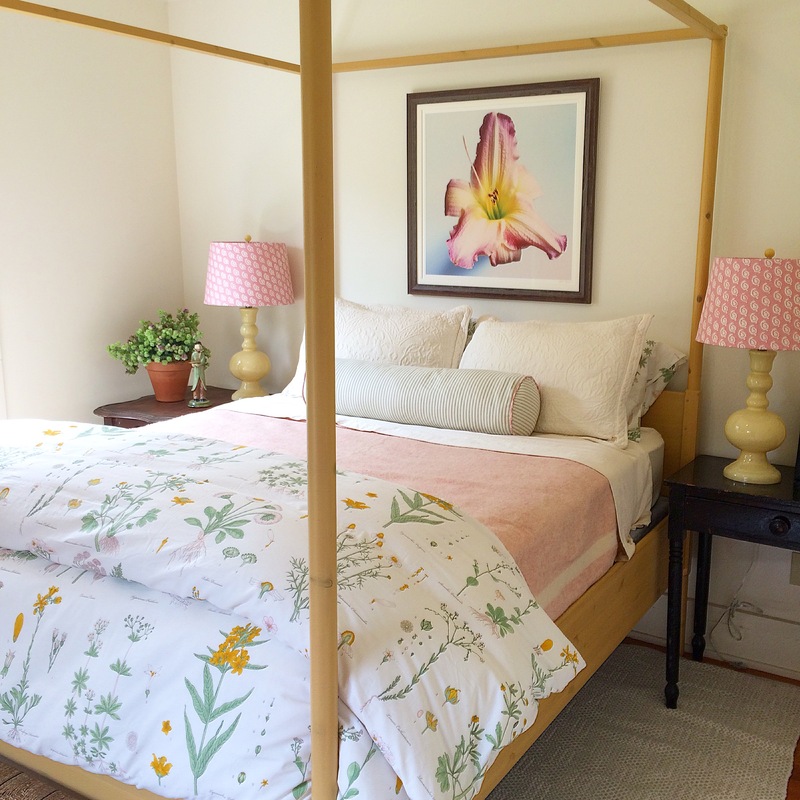 The bed is so gorgeous and my absolute favorite are the lampshades in the Peter Dunham. Just so perfect for this beautiful harden room. You’ve done it again. stunning space! i LOVE it! Um, I’m a huge Garth fan. I have missed him. I could go on,but that would be weird. I love this beautiful room. Yes, the art is the show-stopper. Great job, and lovely styling. Beautiful job, Kate!!! Love how you pulled it all together. All those pretty pinks, and the rustic touches that keep it feeling perfectly country chic…so good. And I just love that you used an Ikea duvet at your starting point!!! Such a lovely put together room. I LOVE that bench…the detailing is amazing! 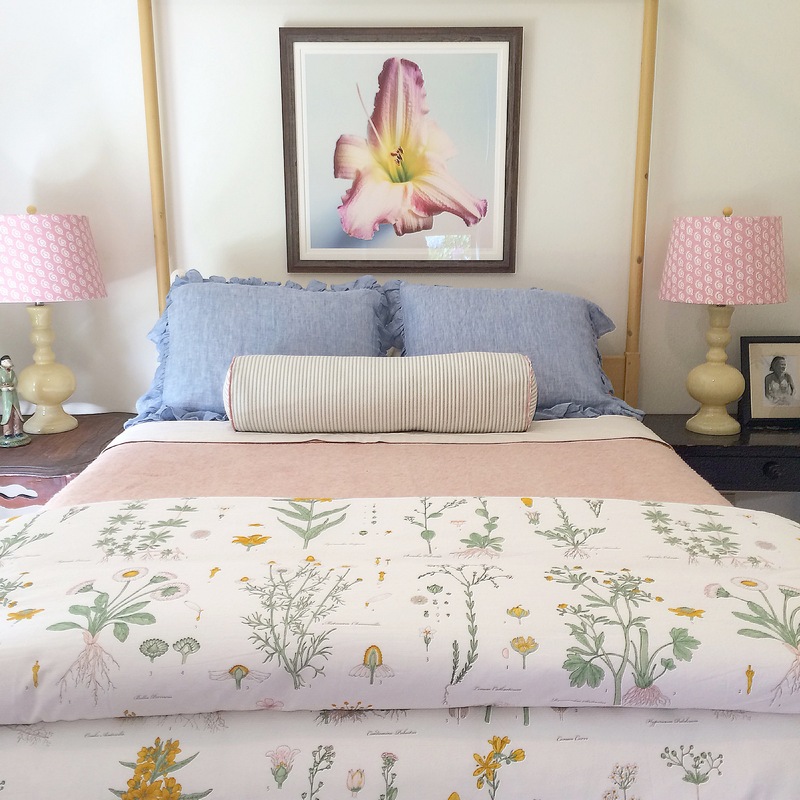 Wow everything looks gorgeous, I’m particularly obsessed with the duvet & striped bolster – fabulous design Kate!